Scheduled and ready to drop! That was the last bit of organisation for me. All I need to do now is run the day. I’m so excited to see what people think of it all. Can’t wait! Will you be joining in? Coming in person, or online? I’m tempted to join for part of the day on-line but, with the time difference, I’ll have to miss a lot of it. I am tempted to check it out. Perhaps you can tell me what it’s all about, and save me from doing any independent research? 😉 Oh, and fyi, I just bought myself a copy of your Apocalypse Blog Book, volume 1. Looks very intriguing, and a very cool concept! It’s like a modern take on the first-hand account of the apocalypse, except with a blog instead of an oral history. Matt – the info is all on the Writers’ Asylum page (which I forgot to link to in the post). 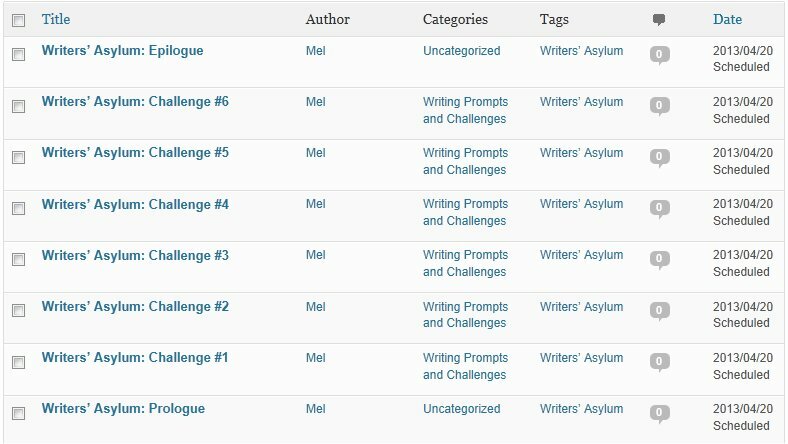 It’s a day of writing challenges, one every hour on the hour. As a quick rough and ready way of working out time zones, there’s this. Sorry, I just checked the page and saw you had already put something about timezones up.